The next ‘Winnie’ plaque fundraiser has been announced! 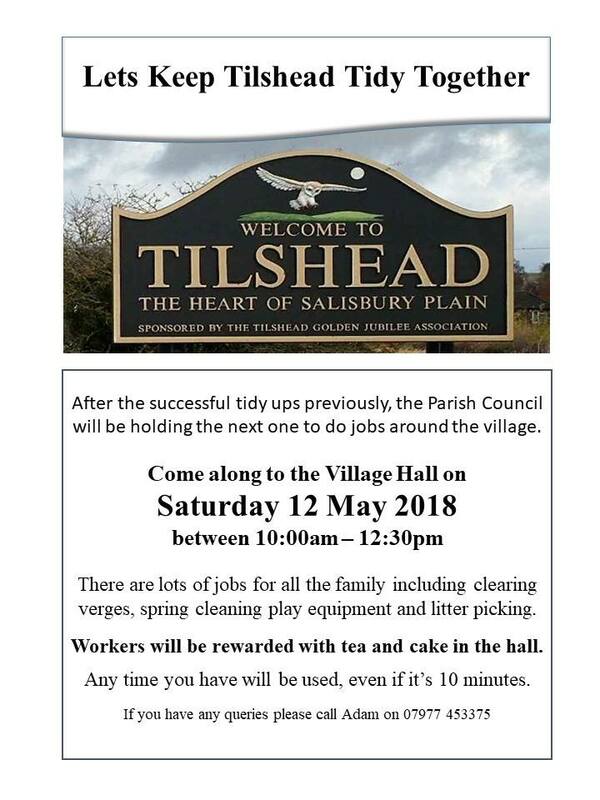 There will be a breakfast in the Village Hall on Saturday 12th May 2018. On 7th May 2018 Dorothy House Hospice will have a stall at the May Fair in Devizes Market Place. They will be selling handbags and scarves; so if you have any tucked away that you no longer need, please could you donate them? Please drop any donated handbags and scarves off at Waylenfield before 7th May 2018. 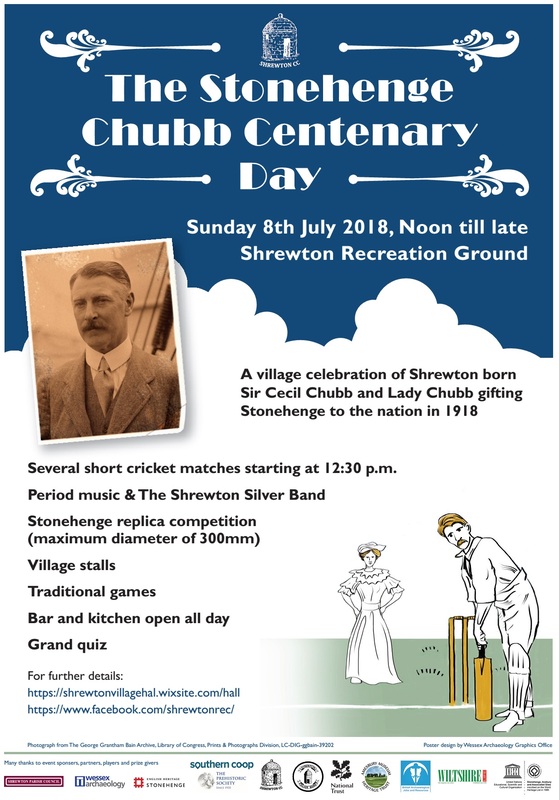 A ‘village celebration’ is being held at Shrewton Recreation Ground on Sunday 8th July 2018 to mark Shrewton born Cecil Chubb and his wife Mary gifting Stonehenge to the nation in 1918. Entry is free and there will be a cricket tournament and village stalls, the Shrewton Silver Band will play. A Flood Alert has been issued by the Environment Agency. Flood Alert in force: Groundwater flooding in the Salisbury Plain area. Flooding is possible for: Boscombe, Cholderton, Collingbourne Ducis, Hanging Langford, Hindon, Hurdcott, Idmiston, Newton Tony, Orcheston, Porton, Salisbury, Shipton Bellinger, Shrewton, Stratford Sub Castle, Tidworth, Tilshead, Tisbury, Wilton, Winterbourne Stoke and Woodford. Be prepared. Groundwater levels have responded quite steeply to the weekend’s heavy rainfall, particularly to the West of Salisbury Plain. Communities including Tilshead, Orcheston, Shrewton, Chitterne, Codford and those along the Wylye Valley are most likely to be affected. Residents should prepare property level flood resilience measures including pumps where they are fitted. People driving through flood water should take extra care both for their own safety and to ensure that their bow wave doesn’t cause flooding to properties lining the roads. Or call Floodline on 0345 988 1188 using quickdial code: 210022. Follow @EnvAgency and #floodaware on Twitter. Tune into weather, news and travel bulletins on local television and radio. Monitor local water levels and weather conditions. Get ready to act on your flood plan if you have one. Move your car or other vehicles to higher ground, if it is safe to do so. Prepare a flood kit of essential items including a torch with spare batteries, mobile phone and charger, warm clothes, home insurance documents, water, food, first aid kit and any prescription medicines or baby care items you may need. Check that you know how to turn off your gas, electricity and water mains supplies. In rural locations, farmers should consider moving livestock and equipment away from areas likely to flood. Avoid walking, cycling or driving through flood water. 30 cm of fast-flowing water can move a car and 6 inches can knock an adult off their feet. Flood water is dangerous and may be polluted. Wash your hands thoroughly if you’ve been in contact with it. The water level today has risen to 97.46m. The Parish Council strongly advise residents to check any equipment you have just in case the water continues to rise. The various springs around the village are likely to start flowing around 99m. We will continue to monitor the water levels and post updates. We have been closely monitoring the water levels and have now seen an increase in the water level of 2.5m over the last 7 days. The current level is sitting at 97.07m. As I’m sure many people will be aware that the springs around the village tend to rise around 99m. As we are getting close to this level the Parish Council are advising residents to check that any equipment you have works. We have today ordered additional sand bags and sand which will arrive on Tuesday. Lets hope the level doesn’t continue to rise but if it does we will hopefully all be prepared. I know some residents don’t have access to Facebook or the website so please let your neighbours know if you can. We will continue to monitor the levels and post updates if they continue to rise. Keep an eye on the flood warnings and borehole levels here. Below is my first annual website report since taking over as Webmaster. Please submit any suggestions, comments and upcoming Tilshead events using the contact form. To subscribe to the weekly digest emails mentioned in the report, please register here. After a short break following the sudden passing of Libby Anson, founder and editor of the Tilshead Newsletter, publishing of the Tilshead Newsletter has started again. A big ‘thank you’ goes to the previous Newsletter Team and to the new Newsletter Editorial and Distribution Team. The April Edition (nr 198) should be in your postbox soon or copies can be found in local shops and businesses.